By Fr. Jude Winkler, OFM Conv. One of the most consoling promises that Jesus has made to us is that whatever we pray for in his name will be granted. He has promised to be our intercessor with the Father, and that we will never feel cut off from the power of God. If Jesus made this promise, then why should we bother praying for the intercession of the saints? Should we not simply pray to Jesus, trusting that He will grant us whatever we need? This increased responsibility can be seen as an obligation, or it can be understood as a ministry. A ministry is any work that is done in the name and love of God. If one reflects upon one’s role of grandparent, one can make that relationship a blessing. Before we can address that question, there is a more basic question to ask. Does Jesus really grant all those things for which we pray? Very often we pray for something for years and years and we never seem to receive it. So what are prayers and how do they work? 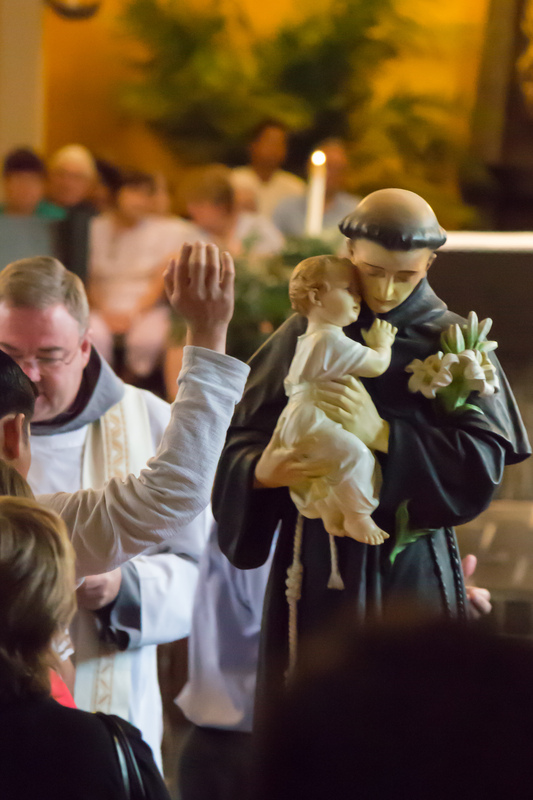 A pilgrim, about to receive the Holy Eucharist, reaches out to touch the statue of St. Anthony, seeking his intercession. At times we approach prayer as if God were a machine and we have to place the proper fuel in that machine to make it work. Our prayers are that fuel, and if we strike the proper mixture of novenas, candles and promises to reform our lives, then God is all but obliged to give us what we want. At other times, we recognize that God might not grant us what we want. Therefore, our prayers seem more like tokens which we place in a slot machine. We say our prayers and pull the lever, hoping that our three oranges–our miracle–will pop up. All of this is to take a very mechanical approach to our relationship with God. God is not a machine which we prime with our prayer. God is a person, and our prayers are communication, an expression of love and trust. In prayer, we join our love to that of God and we trust that God will respond to our need in the most loving way possible. This is where some of the confusion lies. We almost always believe that the most loving response to our prayers would be to grant what we want when we want it. God often realizes that we can be more loving people if the response to our prayer is not the miracle that we request. Sometimes we learn patience when our request is not granted, or we learn to trust in the midst of suffering, or we learn to persevere in our request. Because prayer is an expression of love, we often ask others to join us in prayer for a particular need. It is not that we will develop a greater weight of prayer when more than one person is praying for a need. It is that when I express love, I naturally want others to participate in my love. It makes a difference when I am praying together with a friend or with my Church for a particular need. The more love that is expressed, the easier it is for us to respond to God’s response with love and trust. What has been said about wanting out family and friends to join us in prayer for a particular need can also be said of the saints. We can pray to God without asking for the intercession of the saints, but because our prayer is an expression of love, we want everyone in our community of love to join us in our prayer. But who exactly are saints? At its broadest definition, saints are people who were so in love with God and with their sisters and brothers in this life that they continue to express that love even after their deaths. Their love is stronger than death. They will continue to express love for those who are still on this earth until they are one again in heaven. Most of us have experienced this in our own lives. We have a favorite relative, or a husband or a wife who has passed away. At first, we were overwhelmed by the loneliness of separation. It feels as if all the love which we had shared had somehow been defeated and now we were all alone. Then one evening we felt a presence alongside of us. We were not afraid; we did not think it was a threatening presence. We simply knew that our loved one was there with us. We began to talk to that person. We began to feel the help of our loved one in difficult times. This experience teaches us what the saints mean for us. The saints are all those who have gone to heaven. Yet, the Church has chosen certain men and women whom it has officially proclaimed as saints. These are women and men who were so courageous and generous in their love that everyone knows that they are in heaven. Their love was so large and expansive that they want to reach out and embrace the whole world. These, in fact, are the two basic requirements for one to be canonized: that there be a devotion to that person and that the intercession of that person be proved through the miracles obtained by praying to that person. When this has been certified, the Church proclaims that these heroes are both examples of lived faith and intercessors in time of need.